did you hear a funny sound, kind of like ka-boing? 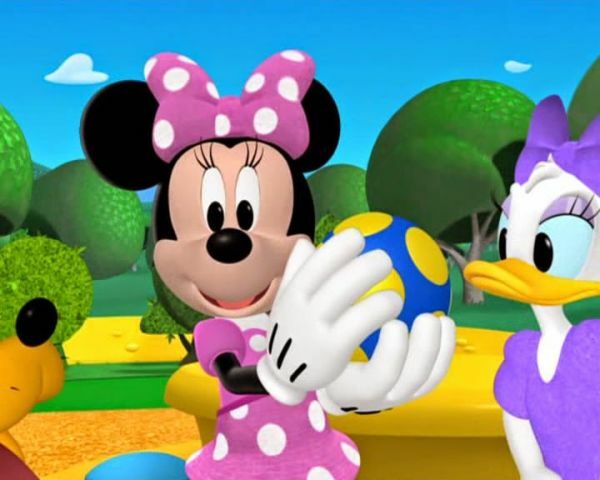 MINNIE: You mean, like when someone bounces a bouncy ball? MICKEY MOUSE: Yeah, exactly. GOOFY: I don't know if I heard anything like that. We were too busy playing around, bouncing Pluto's bouncy ball. Wait, I bet you heard us bouncing Pluto's bouncy ball. MINNIE: It's a new game I invented. I call it Who Can Bounce Pluto's Bouncy Ball The Highest? Anyway, whose turn is it? DAISY: Let's see, I went first. GOOFY: And I went second. I think you're gonna be third, Minnie. DAISY: And Donald is fourth. DONALD DUCK: Oh, boy, that means it's my turn. MICKEY MOUSE: Wait, Donald. Fourth is after third. So, since Minnie's third and you're fourth, that means you go after Minnie. It goes: First, second, third, fourth. DONALD DUCK: Oh, okay. MINNIE: Here goes. DONALD DUCK: Wow! How about that? Look at it go. All right, now it's my turn. 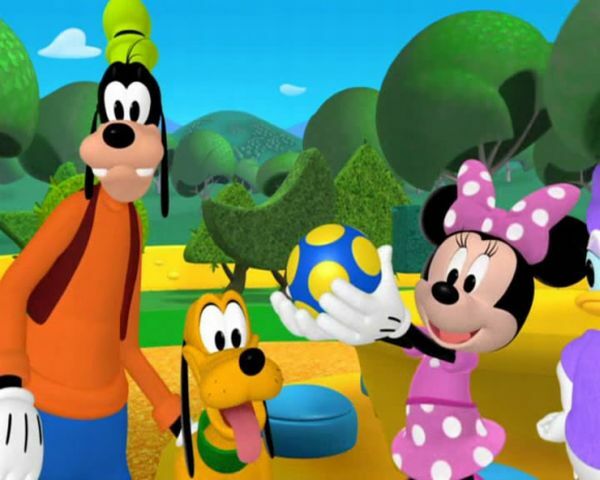 GOOFY: Gosh, that bouncy ball's flying up so high and far away, I can't hardly see where it's going. MICKEY MOUSE: Hmm. What do you think we can use to see Pluto's bouncy ball so far, far away? DAISY: Oh, oh, I know. We can use the Clubhouse Telescope. MINNIE: Oh, that's a great idea. GOOFY: Why didn't I think of that? 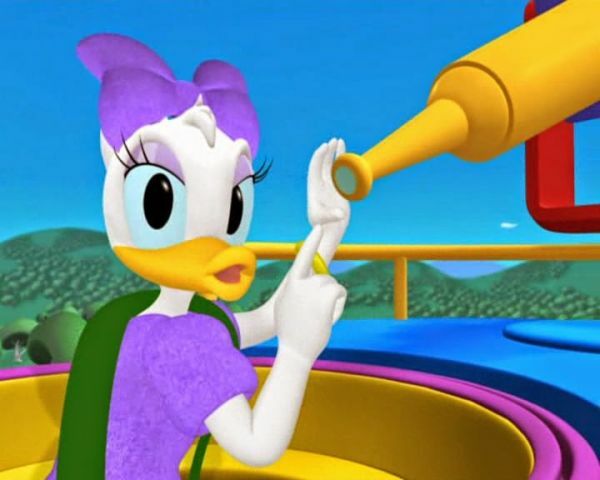 DAISY: Come on, the Clubhouse Telescope lets us see far away things like they're up close. Look. Wow, Pluto's ball is going higher and higher, past all the stars, and all the way to the moon. 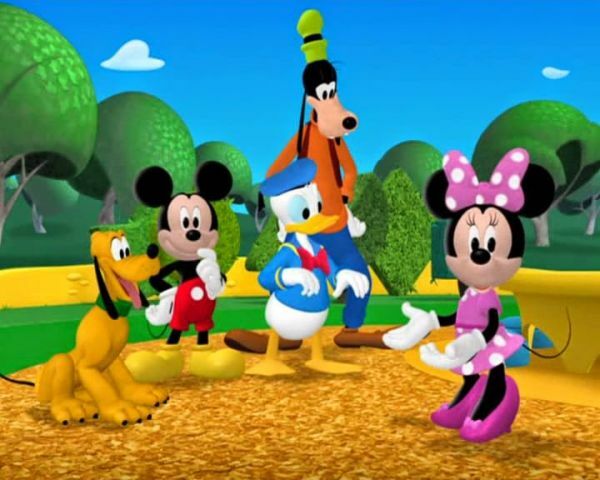 DONALD DUCK: But it's supposed to be my turn now. Aw, I want my turn. MICKEY MOUSE: Well, I'm sorry, Donald. But Pluto's bouncy ball is up on the moon. DONALD DUCK: Why does this always happen to me? GOOFY: Aw, crumb-buckets. Too bad we can't just go to the moon and find Pluto's bouncy ball. Or can we? MICKEY MOUSE: We can. 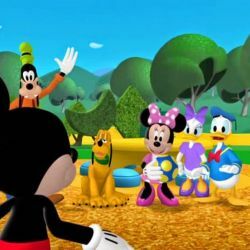 Here are your Mouseketools MINNIE: A sand bucket and shovel. How fun. Bouncy shoes. GOOFY: A giant umbrella. DAISY: And the Mystery Mouseketool. MICKEY MOUSE: That's a surprise tool that can help us later. 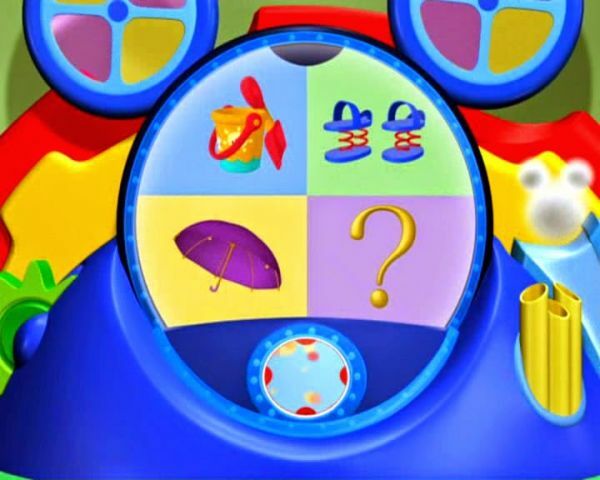 MICKEY MOUSE [SINGING]: Toodles has the tools The Mouseketools So when we need them Toodles will bring them He's here for meedles and youdles And all we have to say is "Oh, Toodles".